Fine Decorative Designer Lamp Available In Different Designs & Sizes. A large oxidized tin lantern which can be used either as a hanging lantern or as a candle lamp. Has a clear glass bottom. Has panes of clear, red, yellow, green & blue glass. 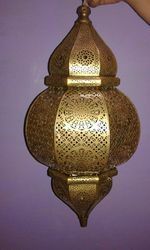 A very traditional style lantern handcrafted in Marrakech. We are one of the well-known manufacturer, supplier and wholesaler of a qualitative range of Designer Lamp Base. These wooden products are ideal for decorating purposes in homes, restaurants, offices, hotels and many other places. These products are offered at economical rates to our customers. 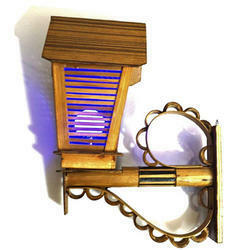 Customers can avail from us our beautiful range of Designer Lamps. The Lamps we offer are made by expert artisans and fitted with LED’s, so they not only look elegant but also consume less power.